Misa Kuranaga and Boston Ballet in George Balanchine's Coppélia, courtesy of The George Balanchine Trust. Photo by Liza Voll, courtesy of Boston Ballet. Boston Opera House, Boston, MA. When you think of a classical story ballet, what comes to mind? Fairies, princes and princesses? Unrequited or otherwise problematic romantic love, and sometimes that somehow resulting in a happy ending? Or something else? 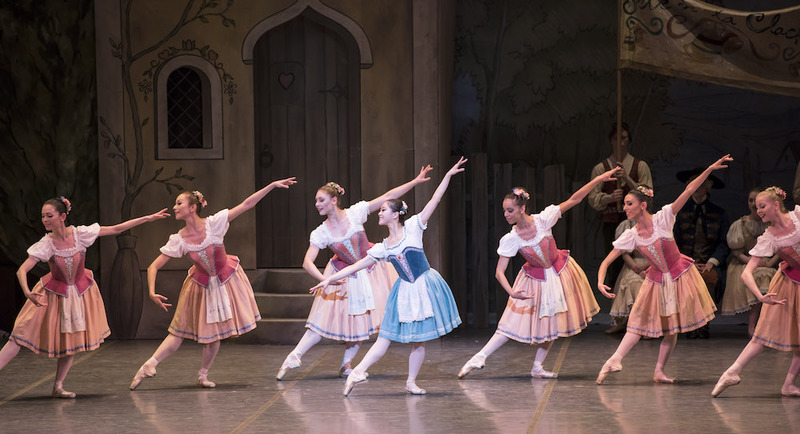 What feels so fresh and compelling about Coppélia is how it breaks out of classical ballet norms — such as through unconventional characters, humor and fun — while maintaining much of classical ballet’s common structure, themes, and aesthetic. The movement itself stays within the classical ballet idiom, while adding in inventive touches that feel ahead of their time. Boston Ballet in George Balanchine’s ‘Coppélia’, courtesy of The George Balanchine Trust; photo by Liza Voll, courtesy of Boston Ballet. Boston Ballet delivered all of this with creative command and thoughtfulness in its recent restaging of the classic. It all began with a jumpy, joyous overture (music by Leo Delibes). The curtain rose on a humble, old-fashioned town — not ostentatious, but proud (whereas many classical ballet settings can feel quite opulent – scenic design by Robert O’Hearn and Benjamin J. Phillips). A man, Frantz (Derek Dunn) knocked at a door, and moved on once no one answered. Then came out a young woman, Swanhilda (Misa Kuranaga) — moving with the quality of a young, innocent schoolgirl but one very sophisticated and mature for young age. She gestured with crossed wrists, a finger over her lips, and pointing as if gossiping and being coy. This gesturing laid the groundwork for the fun, humor, and relatability seen in the work overall. Kuranaga’s ballon had a quality in its descent like a leaf falling to the ground on a crisp fall day — soft yet controlled. In a lovely balance of lift and grounding, her lines were entrancing. Dunn offered a lightness yet also strength, beginning to build Frantz as a comical, affable character with a grounding in goodness. Soon a larger group of both men and women joined them. They all danced in and out of circles — separated by genders, pairing off, into trios, and other variations. Hearts and chests were lifted proudly, while feet were light yet assured. A classic ballroom idiom had a folksy feel through a soft quality in their bodies as well as inventive flourishes in port de bras and footwork. More pantomime followed, bringing further humour and fun. Swanhilda mimicked doll-like movements, telling her friends (and other townspeople) about Dr. Coppelius’ doll (as the program described). Swanhilda’s friends had beautifully colored costumes, with shades of purple, pink and red fading into each other like watercolors. Swanhilda’s white and blue dress supported the sense of her as innocent and sweet (costume design by Kenneth Busbin). Some townspeople dispersed, and Dunn and Kuranaga danced a delicate, heartwarming pas de deux. A corps de ballet danced behind them and infused imaginative movements not typical to conventional corps de ballet vocabulary. These included arms sweeping like windwill blades through space — as well as a rising and falling also emulating the circular rise and fall of those spinning blades. Swanhilda exited, who Frantz almost followed, but instead h stayed and danced a solo of circling and reaching qualities. He was caught in, but also reaching out with, his love for her. The corps, Swanhilda’s friends, approached and danced a section of light and lifted little jumps (petit allegro), sweet as toffee. She returned to dance her own staccato, powerful solo. The movement found venturing away from the from the midline of the body, compellingly unconventional in classical ballet — such as dipping her torso to the side, starting with a motion as if spilling something out from the top of her head. Another group section from Swanhilda’s friends had a more weighted quality, conveying a building of the drama at hand. To end the act, Swanhilda found the key to Dr. Coppelius’ shop (another explanation from the program), and formed a line with her friends, them all holding hands. They walked off, and Frantz — with a ladder — followed. He placed it against a building, began to climb, and lights went out. The second act’s beginning continued from the first’s end, Swanhilda and her friends walking slowly, in a line, holding hands, now in Dr. Coppelius’ shop. Like the town outside, it was decorated humbly yet proudly — plain colors and designs housing many different tools and trinkets. Gradually, we saw Frantz climbing up the ladder into the shop. This act had, overall, less dancing and more theatricality. The cast showed themselves to be as adept at building convincing characters as they did with virtuosic dancing. They delivered as much humour, fun, and refreshingly inventive movement in this act, as well. As Swanhilda carefully creeped closer to a mysterious closet in the corner, her friends crouched back and huddled in fear. The audience chuckled at little humorous touches like these. She eventually got into the closet, allowing for the plot point to come of her replacing Dr. Coppelius’ doll, Coppélia. 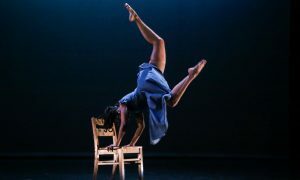 Perhaps creating the commotion and distraction that allowed for this transfer, and the coming plot to unfold, were seated dolls (roles played by dancers). It seemed that whenever Dr. Coppelius (Paul Craig) got close to understanding what was going on, they would move their arms in fast, repeated patterns while cymbals crashed. Dr. Coppelius discovered Frantz soon enough, however, and had him drink a sleeping potion. 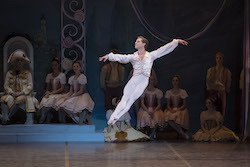 As the program synopsis explained, he believed that he might be able to draw out from Frantz the life necessary to bring Coppélia, whom “he thinks of as a daughter”, to life. I wondered how much I would understand this plot without the program synopsis, but perhaps that’s why it exists. There are complexities within story ballets such as this one that can perhaps not be conveyed in movement — at least that which isn’t overly literal and complex to the point of incomprehensibility. Derek Dunn and Boston Ballet in George Balanchine’s ‘Coppélia’, courtesy of The George Balanchine Trust; photo by Liza Voll, courtesy of Boston Ballet. Eventually Coppelius found Swanhilda, disguised as his Coppélia. She danced a Scottish and then a Spanish cultural dance (forms in which Kuranaga seemed just as at home as she does in classical dance), before Dr. Coppelius discovered that she wasn’t his doll come to life after all. He crumbled in despair. It occured to me that this plot requires a bit of suspension of disbelief; it seems a bit unlikely that a young woman in the town would look enough like this magician/toymaker’s doll that he wouldn’t recognize her as not his doll. Perhaps those types of things, that can only happen in fantasies and fairy tales, being in classical story ballets are part of their magic. The third act, exhibiting Swanhilda’s and Frantz’s wedding, was all about joy, love, and lightness. The set was enchanting — large overhead flowers and arches in pastel colors, with a Rococo feel yet less ostentatious. Group sections — with townspeople, Swanhilda’s friends, and others — had enticing formation shapes and changes, bolstering the sense of harmony in the joyous wedding day. 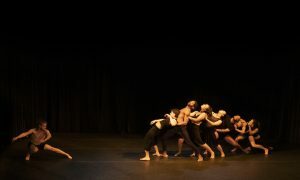 Three solos — Dawn (Maria Baranova), Prayer (Rachele Buriasi), and Spinner (Maria Alvarez) each presented a different clear and intriguing quality. On the classical side of things, ending out the act (and the ballet) was a pas de deux from Swanhilda and Frantz followed by two solos from each of them — a classic coda. In this section Kuranga offered a playful quality through interspersing understatement into her more powerful virtuosity. Dunn exhibited a dynamic, impressive presence in leaps, turns, and more. It all ended with a gargantuan, memorable tableau of all the personalities who had been in the act. Leaving the theater, after joining in enthusiastic applause, I thought about how the choreography was George Balanchine and Alexandra Danilova’s adaptation of Marius Petipa’s work from 1884. Perhaps this collaboration across the ages was a perfect mix of classicism and modernism, with good amounts of fun, humor, love, and lightness swirled in. What a delight!